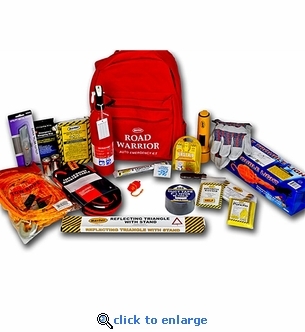 The Mountain Road Warrior Emergency Kit provides essential items for most road emergency situations. Accidents, breakdowns or weather related events can leave you stranded on the highway miles from help. Being prepared with the Mountain Road Warrior kit can provide instant relief. All items are packed in a heavy-duty backpack that's easy to store in your vehicle or trunk. The fire extinguisher shown has been replaced with the new Kidde Auto FX5 II 5:BC fire extinguisher.